My friends and I are big fans of Finding Bigfoot, the highly acclaimed TV series in which a team of four professional “Squatch Hunters” tries to track down the legendary Bigfoot. On this show that has become popular due to its ridiculousness, the team utilizes thousands of dollars worth of high-tech night vision equipment along with their natural squatch sense to track down “evidence” in hopes of someday proving the existence of Bigfoot. On one particular episode, the team’s leader and founder of BRFO (Bigfoot Research Field Organization—naturally), Matt Moneymaker stated that he has spent the last 25 years of his life looking for this elusive (or much more likely, non-existent) creature. 25 years. Wow. That’s a long time to be looking for anything, let alone a mythical ape-like mammal. In disbelief I said to my friends, “Imagine how hilariously tragic it’s going to be when this guy stand before Jesus, and Jesus says, ‘So Matt, how did you spend the life I gave you?’ and Matt replies, ‘Uh…Well, I spent my youth, my money, my passion, my energy, and a total of 25 years of my life looking for Bigfoot.” Again, we burst into laughter. But after a few minutes I was struck by a convicting thought: Is whatever I’m looking for any less ridiculous? 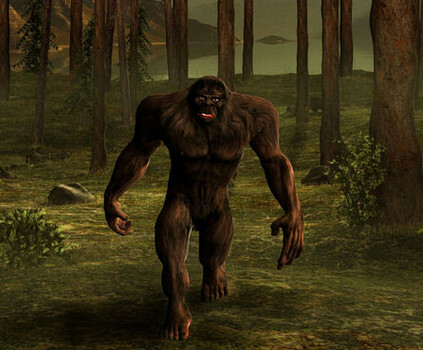 When it comes down to it, is running after wealth, or popularity, or pleasure, or fame, or comfort, or success any less absurd than running after Bigfoot? In other words, in an attempt to make our lives significant by becoming rich, or beautiful, or well-liked, we’re actually on an endless and meaningless search for something we will never find. I look at Matt Moneymaker and think ‘what a silly and ridiculous way to spend your life!’ but is not Jesus saying the very same thing to those of us pursuing anything other than Him and His Kingdom? Think of all the time, energy, and resources that Matt Moneymaker has expended to find a creature that probably doesn’t even exist! And yet, perhaps it will be just as embarrassing to tell Jesus about all the time, energy, and resources I expended on my search to find significance and worth apart from Him. Imagine your hopeful grin as you stand before Jesus with a nice car, or a pile of money, or a thousand facebook friends, or whatever else we might chase after and realizing that you missed the point—you wasted your life. And here’s the thing about the show Finding Bigfoot: they never actually find him (a more appropriate title would be Looking For Bigfoot). According to Jesus, the same goes for looking to save your life—you’ll never actually do it. The only way to save your life is in losing it to the One who died to save it. Ask yourself, son, Is this what I’m chasing after today? When I taught English, students would occasionally complain that the literature we read was boring. A student would begrudgingly oblige, reading word after lifeless word as though skimming an instruction manual. I hate to say it, but some days when I look into my students’ faces I’m convinced the zombie apocalypse has begun. I’ve gotten into the habit of having students check their pulse as they come into the classroom as a way of reminding us to wake up, to be ready, to be alive. What breaks my heart is when we do this to Jesus. One of the biggest hurdles I see keeping young people from experiencing the revelation of Jesus is the idea that he is…well, boring. Jesus, the one whose entire life is surrounded by controversy, surprise, outrage, suspicion, glory, disappointment, and astonishment; the man who one minute is being hailed as the messiah and the next is accused of being the devil; the one who infuriates the religious leaders by breaking Sabbath rules to show his Father’s true heart; the one who touched a guy with an infectious skin disease, ignoring his 10 foot radius bubble of uncleanliness; the one who has the Pharisees plotting with the Herodians on how they might assassinate him; the one who disappoints the Jewish world by going to a cross instead of a throne; the one who rises from the dead, disguises himself, and walks eight miles with a couple of his dejected followers acting like he knows nothing of the weekend’s events until finally showing them at the end of the journey that it was him all along—this Jesus is boring?! Jesus was accused of many things while on earth, but never once of being dull. I mean, come on, you’d be kicked out of church just for supporting him (John 9:22), he must be a little bit interesting. Somehow, we’ve become so far removed from the world of Jesus that we no longer understand what the folks of his day were getting so worked up about. We read the Bible scanning for information or instruction and miss the revelation of it all, the life pulsating in the text. Trust me, son, Jesus is there, we’re just too boring to notice. If anything, we’re the ones who are boring Jesus, not the other way around. I can see him yawning now. 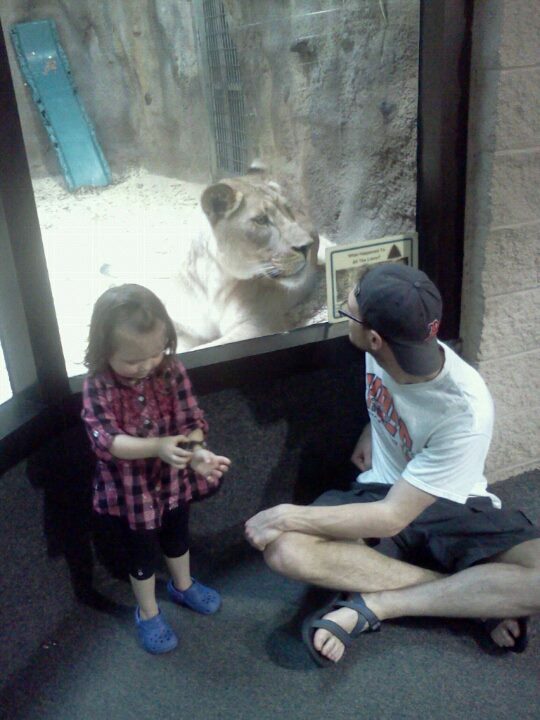 This reminds me of the time Amanda and I took our niece to the zoo. We were so excited for her to see animals she didn’t even know existed. Unfortunately, she never saw most of these incredible creatures. All day she was mesmerized by a cheap plastic wristwatch. At one point I sat her down facing the lion cage thinking it would shake her from her stupor, but even though her nose was no more than eight inches from the face of a 400 pound lion, she never even noticed. I called to her, I pointed, I danced a jig trying to get her to see this amazing creature, but she never saw it because she was too busy looking at the dumb watch. Do you see the Lion, son? Do you see his golden fur swelling out and in as he drinks in whole buckets of air? Do you see his giant tail swishing back and forth with vivacity and joy? Are you close enough to hear the low rumble of his name growing in his throat while your knees knock together in expectancy? Put the wristwatch down, son, because blessed are those who see the Living God and know better than to think that He’s the boring one. Guess what, son, I know God’s will for your life. Before you start thinking I have some special insight into what college you’re supposed to attend, or I know the name of the girl you’re going to marry, or I can discern what career you need to pursue, let me tell you a story. About a year ago I was offered a job teaching Bible at a great school in Holland. The only problem was that I already had a teaching job in Lansing that I really enjoyed. Naturally, I wanted to know what I should do. So I asked God. I started wondering how this whole “will of God” thing worked. Isn’t He supposed to make it clear to me through a dream, or at least a sign of some sorts? This proved disastrously confusing as I began seeing contradictory signs in every conversation. I’d see a quote on Facebook, “Don’t be afraid to move on and start a new chapter.” Next I’d read a magazine article about staying committed to one place for a long time. After a few weeks of seeing “signs” just about everywhere, the only thing I was sure of was that God was messing with me. I read the way God communicated with his servants in the Bible and become plain jealous. “You will go on from there until you reach the great tree of Tabor. Three men going up to God at Bethel will meet you there. One will be carrying three young goats, another three loaves of bread, and another a skin of wine. They will greet you and offer you two loaves of bread, which you will accept from them. After that you will go to Gibeah of God, where there is a Philistine outpost. As you approach the town, you will meet a procession of prophets coming down from the high place…” (God speaking to Saul, from 1 Sam. 10). And on and on. Seriously, God? You gave Saul step-by-step GPS directions and you’re not even going to tell me where to work? As I became more and more afraid of making the wrong decision and somehow going against God’s will, the Holy Spirit finally spoke up. “Trust Me,” God said. I politely insisted that I’d need more information than that if I was going to make the right decision, but nothing more was said. I was getting ready to bust out some Urim and Thummim (look it up), when a new thought hit me like soaking wet wool fleece (or should it be dry?) to the face: Maybe God’s will isn’t as much about where to be as it is about who to be. God wanted me to be a man who trusted Him, that much was pretty clear. It was also pretty clear that I hadn’t been trusting. Ironically, I hadn’t been doing God’s will because I was so worried about doing God’s will. All along he wanted me to rest in the assurance that I serve a good God who doesn’t abandon His children at the drop of a hat. So I confidently made the decision to accept the job, knowing that a life surrendered to the Living God could be used anywhere. I learned that the person I am becoming is often more important to God than where I am going. And this isn’t just a 21st century thing either. God led his people in circles in the wilderness for forty years just to teach them dependence on Him. The Promised Land could wait; their hearts needed shaping first. I think the same is true with us today. Instead of always badgering God about where we should be, perhaps it’s high time we looked to His word about who we should be. We might be surprised by how clear God is about this in His Word. Son, I can say without a doubt that I know God’s will for your life. God’s will is for you to be humble, thankful, compassionate, joyful, prayerful. He wants you to love Him with all your heart, soul, might, and mind. He wants you to love your neighbor as yourself—even your enemies. He wants you to notice the people others brush past, to care for those who might be hurting, to be salt and light wherever you may be. God wants you to persevere in hard times, to hope in confusing times, and to trust Him at all times. Run after these things and you will be right where God wants you to be. So come to find out the sun is humongous. Like really big. I mean, the earth alone is unimaginably large. Just last year scientists discovered a remote part of the Amazon rainforest that people had never been to before and found 258 new species of plants, 84 new kinds of fish, 22 new reptiles, 18 undocumented birds, and 1 new mammal (it’s a monkey that purrs like a cat when it is happy). How crazy that we’ve lived on this planet for thousands and thousands of years and haven’t even seen the whole thing yet! A few days ago I walked from Zeeland to Holland (about 7 miles) and it took for-ev-er. As long as my exhausting walk took, the distance registers less than the diameter of a grain of sand on google maps, even when just looking at little ol’ Michgian. My fist thought was that Lewis and Clarke must have been insane. My second thought was something along the lines of, Whoa, Earth is a beast. But as massively massive as planet Earth is, my brain pooped its pants when I was told that the sun is an estimated million times bigger. A million times bigger?!?!…what? Does it seem just a little humorous to anyone else that there is giant ball one million times bigger than our entire planet floating in our sight all day long—oh, and did I mention that the massive sphere is basically on fire!—and no one even acts like this is unusual? Pardon me…PAHAHAHAHAHAHAHAHAHAHAHAHAHAHAHAHA! WHAT?! If my brain had a diaper it would currently be full. I mean, a million times bigger than earth?! What does that even mean? – Everything in my house came from the earth. The toaster, the lamp, the television—all these things came from the ground and are only in their current form after a complicated and precise series of processes and exchanges. It’s like Adam and Eve were given the earth and a piece of paper saying “some assembly required” and here we are today with skyscrapers and jet skis like they magically fell from the sky. – How the human body works. I’ve had one my whole life and still have no clue what’s going on. My brain works without my telling it to. My heart beats without my telling it to. My eyes see without my telling them to. The whole thing is one astonishing compilation of cells, organs…cells…and I think other stuff too (my biological knowledge is slightly limited ☺). – People get so excited over 3D movies, apparently forgetting that life was already 3D to begin with though nobody seemed to notice. The more you think about it the more you start to realize that everything is awesome, and strange, and unexplainable. Here is where the gift comes in. Wonder is essentially having eyes to see. Wonder means living with the conviction that everything connects to everything else. Wonder is going to the border of things imaginable and placing your palms against your brain’s boundaries to feel the warmth of God’s breath on the other side. This is a valuable gift because there aren’t many folks with wide-open eyes. Not only will wonder make you a visionary in the dullness of everyday, but more importantly, it will become a wellspring of worship swelling up and over in your life. Oh, and I almost forgot, it will make school way less boring. I remember waiting in the bathhouse with ten or so impatient campers. We had an hour set aside to wash up before breakfast, but since there were only three working showers, the majority of time was spent standing around. I had just finished shaving and had a good-sized gob of shaving cream left in my hand, so I decided to put it to good use. “Line up!” I said; the awkward adolescents made their way over to see what I was going to do. I went to the first boy, smudged my thumb with cream and began drawing lines on his face in what I hoped would look like some kind of native design. “You are Wild Wolf,” I said in a deep voice, “Brave and true, a defender of the weak. You will be a great leader of men…” and on and on. I went on like this down the line of boys, giving each one a different shaving cream “war paint” design and a new name to go along with it. I was improvising. I was playing. But I quickly discovered that they were not. The young men hushed and drew close to hear what name I would say, to find out what kind of identity I would see and call out in them. Each boy lifted his face to meet the “paint” while drinking in my words greedily, some even ran back to the cabin to grab a pen and page so they could remember their new name word for word. What was happening? Why had this little time-passing game taken on such meaning to these kids? I quickly realized something I had been seeing all summer as a camp counselor: young people, boys especially, are desperate to find out just who they really are. And if there’s no one there to show them the way, to see something good and alive and even daring in them; to call it out and nurture that identity, then surely they will look for a name somewhere else. So I want to give my son a name. I want to give him an invitation to be someone who has something real and important to do. A few hundred years ago our communities needed young men, without whom they couldn’t survive. Now all we need from them is to sit still until the bell rings. And they know it. So they go where they’re needed, even if they know it’s not right or even real. Everything from gangs to video games—after all, aren’t most video games just a way of temporarily being someone else who has a significant role to play in an important story? A good name is like a path in all this wandering wilderness—an invitation, a summons, a call to go a certain way. Granted, a road still has to be walked for it to make any difference, but even so, it’s a start. Names have been used like this in cultures all around the world for thousands of years, most famously in the biblical Hebrew culture, and I want to carry on the tradition. That’s why my son’s middle name will be “Danger.” And yes, I’m serious. First, because what little boy wouldn’t want to be able to say that Danger is his middle name and actually be telling the truth? And second, because I want my son’s name to be a constant reminder of God’s call and claim upon his life. To be a doer. To be an active participant in Christ’s unfolding Kingdom. To be filled with the Holy Spirit of Jesus that is always dangerous and destructive to the Enemy’s causes. Looking around (and I must confess, looking in the mirror), it seems we are under the impression that a Christian man is simply someone who thinks certain things, who believes certain things, who has certain “Christian” opinions. But no matter how much we’d like to believe it, I don’t think our Enemy shutters at our opinions. I don’t think he is threatened, dare I say, even by our beliefs. It is only when the power of Christ’s boundless love takes root in one’s hearts that the fruit of action burst up all over to threaten the dominion of darkness. This is dangerous. And sadly, this is rare. Being dangerous doesn’t always look how you’d think it would. In a culture that prizes quick fixes and easy-way-out-solutions, it might simply mean being in one place for a while. It might mean leaving your comfort zone to do the right thing. It might mean being mocked and laughed at while going out of your way to befriend the friendless. It might mean having the courage to tell the truth when telling a lie would produce better results. It might mean being vulnerable so that others can lower their guard and feel safe. Whatever it looks like, my son’s name will be a constant call to follow The Dangerous One, who relentlessly threatens the seeds of loneliness, despair, isolation, hatred, shame, and sorrow planted by our Enemy. I want my son to know that being a follower of Jesus means being dangerous.